RayBio® Human I-309 (TCA-3/CCL1) ELISA Kit for cell culture supernatants, plasma, and serum samples. This ELISA kit shows no cross-reactivity with the following cytokines tested: human Angiogenin, BDNF, BLC, ENA-78, FGF- 4, IL-1 alpha, IL-1 beta, IL-2, IL-3, IL-4, IL-5, IL-6, IL-7, IL-8, IL-9, IL-10, IL-11, IL-12 p70, IL-12 p40, IL-13, IL-15, I-309, IP-10, G-CSF, GM-CSF, IFN-gamma, Leptin (OB), MCP-1, MCP-3, MDC, MIP-1 alpha, MIP-1 beta, MIP-1 delta, MMP-1, - 2, -3, -10, PARC, RANTES, SCF, TARC, TGF-beta, TIMP-1, TIMP-2, TNF-alpha, TNF-beta, TPO, VEGF. Das, Suvendu, et al. "Tumor cell entry into the lymph node is controlled by CCL1 chemokine expressed by lymph node lymphatic sinuses." Journal of Experimental Medicine (2013): jem-20111627. Leow K., Goh W., Heng C. Effect of serum amyloid A1 treatment on global gene expression in THP-1-derived macrophages. Inflamm Res. 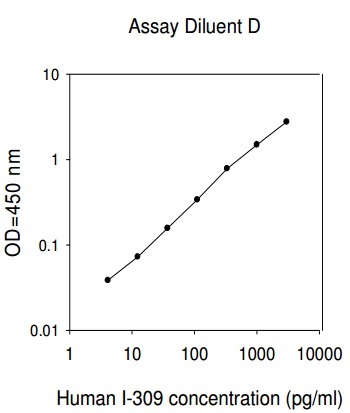 2012 Apr;61(4):391-8. doi: 10.1007/s00011-011-0424-4. Çelebi, Betül, Diego Mantovani, and Nicolas Pineault. "Irradiated mesenchymal stem cells improve the ex vivo expansion of hematopoietic progenitors by partly mimicking the bone marrow endosteal environment." Journal of immunological methods 370.1 (2011): 93-103.